The Thursday “Brown Bag” series runs year round every 2nd and 4th Thursday of the month from 12pm to 1 PM in the public meeting room at the Clallam County Courthouse in Port Angeles. The “Saturdays in the Garden” series at Woodcock takes place every other Saturday during the growing season, at the Woodcock Demonstration Garden, 2711 Woodcock Road in Sequim. Second Saturday Garden Walks are held on the second Saturday of each month from April through September at the 5th Street Community Garden (328 E. 5th St., Port Angeles). The educational walks go from 10 – 11:30am. Topics related to vegetable gardening, herbs, and other food crops will be tailored to what is happening in Clallam County gardens each month. The dates for 2018 are April 14, May 12, June 9, July 14, August 11, and September 8. Master Gardener Volunteers for the Youth Enrichment Program (YEP) visit every second grade classroom in Clallam County each year to make a presentation about how plants grow from seeds. This program offers gardeners a chance to present an interactive, introductory program on botany. The interactive presentations include posters, pictures, a seed-to-plant puppet named Herbie, and planting seeds in a root viewer. The root viewer is left in the classroom for students to watch and study. The program now reaches over 600 students each year. KSQM (FM 91.5): Airs on Fridays, 6:40 am and repeats on Tuesdays, 11:40 am. KONP (AM 1450 and FM 101.7): Airs on the last Monday of each month, 1-2 pm. 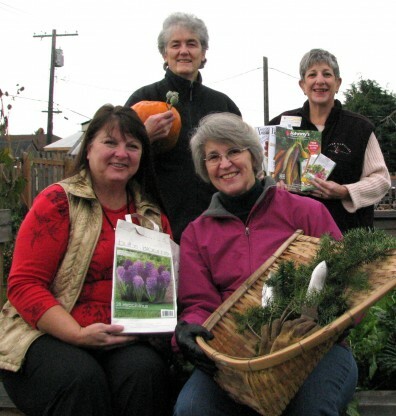 In addition, Master Gardeners arrange a series of seminars in conjunction with the Soroptimist Garden show in Sequim, provide educational speakers for local garden and horticultural clubs, and prepare educational booths for the Clallam County Fair, and other events around town. Master Gardener Rain Garden Mentors work in partnership with the City of Port Angeles to reduce the combined sewer overflow problems in the Port Angeles Harbor through gardening. Mentors are available to help homeowners to assess their properties for rain garden installations. For more information about Rain Garden incentives through the City of Port Angeles, please visit their website on Rain Garden Rebates.